Discussion in 'Star Wars Costumes and Props' started by hyperdyne, Aug 11, 2005. 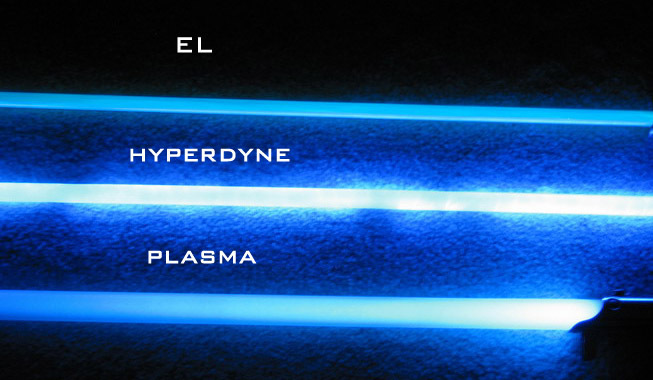 I have been working on what I would call the "ultimate" lightsaber for some time. So I was hoping to share my work with the good folks here, since many others may be striving towards the same goal. Anyway I wanted to design a duelable blade that was very bright and had several advances over existing offerings. I also wanted a removeable blade, scrolling effect, as well proper dimensions. I already tackled the sound portion so I wanted "lights" to go with it. So I sat down some time back and designed these blade electronics myself. At first it was a slow going project, but I redid some of the work lately and it turned out better than expected. 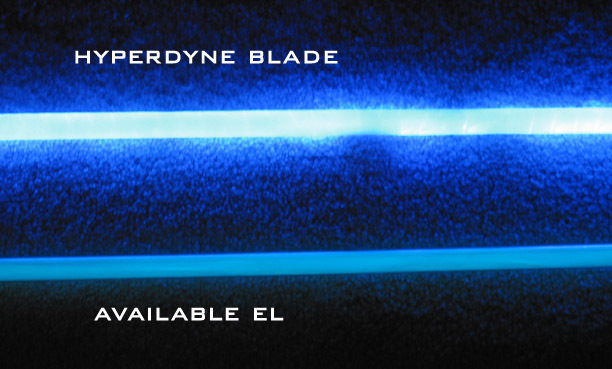 Initial tests have shown the blade to be as bright (or brighter) than a plasma blade. :eek Thus you get all the benefits of plasma - the scrolling blade effect and extreme brightness along with the benefits of a duelable blade and proper blade size. The blade electronics will even fit inside a 0.5" ID tube. At any rate, here are some preliminary tests I ran that I thought to share. 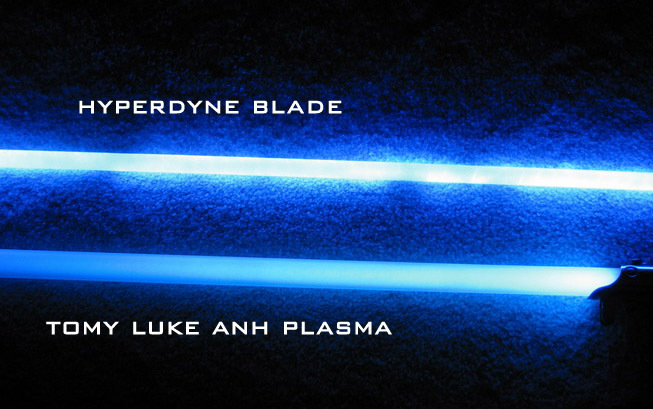 I prototyped a blue blade first since I had several different blue sabers to compare against. NOTE: I dont have my diffusing material yet, so what you see is actually a clear polycarb tube spray painted white. Even with white paint over the tube the light transmission is very good. I expect it to increase with proper diffusion material and an optical end cap. All the pics were taken with 1/8 sec exposure time. On paper this blade gives off more than 200 candela.. The blade runs off a standard battery pack and my own driver board that is only 1.5" long. I plan to do a red blade next, which should actually be brighter. Then I want to do a green blade. Lastly I am going to experiment with white cores and colored tubes to see how they look compared to a frosted blade. Let me know what you think. This has been a long haul project that I am excited to see advance to this stage. Looking pretty sweet. Whats the battery life on your blades? Does the fact that its so bright make a difference? Wow. That IS bright. Congrats on the results thus far- very cool. Man oh man that's some sweet work. Are these going to be just for your wall or are you going to let us buy these sweet blades too? WOW. Thats awesome, when are they gonna be available? Wow. The second you develop a purple blade, please let me know. I'll convert my custom immediately. Amazing work. EDIT: Is the EL pictured there wire or sheet? Just curious. Heck, I am not gonna put these on my wall. I want to duel with them.. I also designed in a couple new features that I am not making public yet. Watch this space for updates. To answer some questions: I havent considered making them in bulk as this is just a showoff of what I have been working on. If it turns into an interest thread then I will create a new thread for that. Battery life is estimated to be 1-2 hrs continuous. I am using a nice small Li-ion battery right now since it is not as large as conventional AA batts but packs the same energy. The EL shown above is wire. But the EL sheet I have is about the same brightness. So in a picture comparison they both look about the same next to the other blades. Someone actually commented that the EL doesnt even appear to be on in the pics. Well believe me I did turn it on..
Lookin' awesome man. Too bad I'm investing all my money at the moment in FX sabers (but they are so COOL. if a little lacking in the sound department). I have an EL-esque question though - it it possible to get the flicker a la ANH with EL sabers? I dont know about EL since I dont use it. I can't wait to see what you do with a red blade and I hope you do these in bulk. Always with the particulars, you are. I suppose you could do this with EL if you wanted to. It would take some modifications. I get the same effect using LEDs. It gives me greater control over the overall look of the blade. Can you comment on the apparent nonuniformity in brightness across the blade...maybe it's just the exposure of the photo that brings it out more?